Audio books and audio dramas: Although Spotify concentrates on adding music, you can find the odd audio book on Spotify. Spotify probably will continue to actively expand this area in the future. And you can find a lot of examples of audio dramas such as Pride and Prejudice, Three Men in a Boat, and Sherlock Holmes narrated by famous actors such as Joanna Lumley, Hugh Laurie, and Sir John Gielgud listed on Jer White’s blog. Comedy: There are hundreds of comic albums on Spotify: Monty Python, Billy Connolly, Steve Martin, Robin Williams, Steven Wright, and Chris Rock are some of the more familiar names. You can also find a few more alternative acts. Be warned that some of the language and the content may not be to your taste. 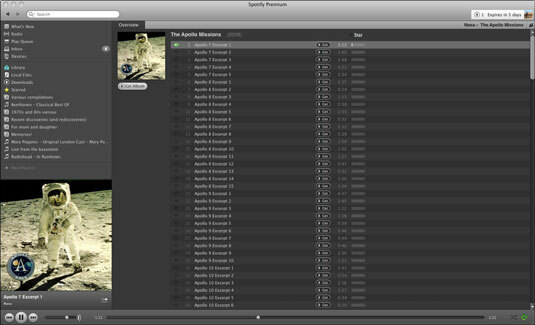 Apollo missions: Did you know you can listen to all the recordings from Apollo missions released by NASA on Spotify? The famous “Houston, we have a problem” line is found about 20 seconds into the Apollo 13, Excerpt 9 track. Audio guides: There are a number of City Speaker audio guides on Spotify that you can listen to before you go on vacation. Or if you have a Premium subscription, why not sync tracks to your mobile phone and play them in Offline mode when you’re out and about? The banter between the two presenters is a little cheesy, but that’s in keeping with the touristy spirit of audio guides! Cities in the series include Barcelona, Brussels, London, Marseille, New York, Prague, and many more. Radio shows: Spotify often experiments with radio shows, where a guest musician acts as a DJ and introduces a number of songs. The virtual band Gorillaz hosted a faux independent-style pirate-radio show on the site. And indie label Domino Records took over Spotify for a week and got a series of music acts to introduce their favorite tracks. As usual, on-the-ball bloggers regularly link to these wonderful kinds of discoveries, so it’s worth doing a web search to see what’s been added recently.